Kelley’s dad and stepmum are visiting this weekend, which prompted me to pull my finger out and get a few things done around the house. One of those things was putting up some more pictures in my office. 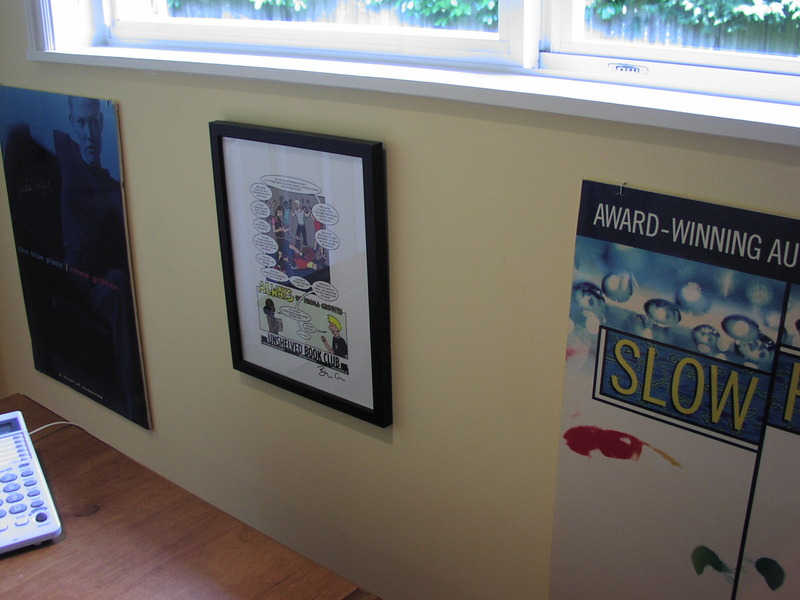 (For pictures of how my office used to look, see this post.) So here for your delectation and delight are more pix of my office space. It replaces the watercolour I’ve had for years (which is now in what I grandly refer to as the yoga room). This beautiful print is called “Lunula,” because that crescent of water reminded me of the armour lunula that some branches of the military used to wear on their breasts, the reminder of breastplates. Jennifer’s website will show you a much (much) better version than my shaky and uncomposed snapshot. 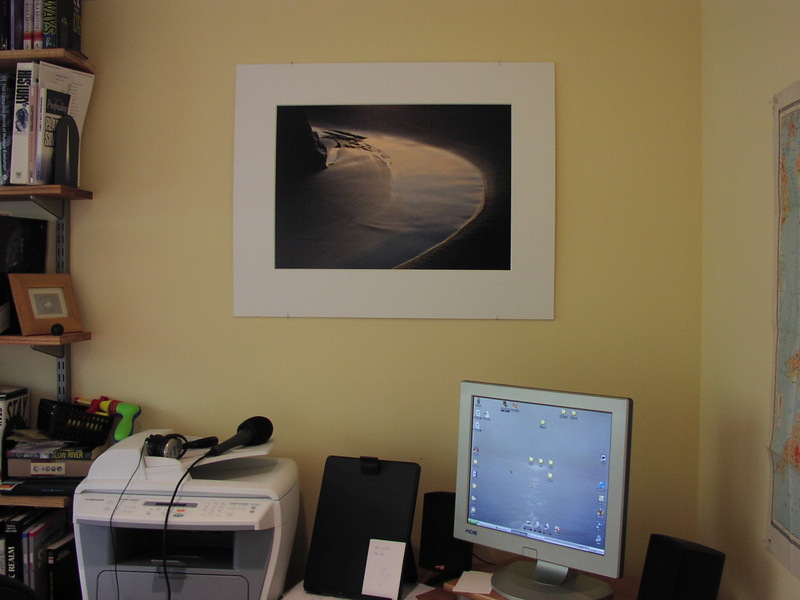 We also have another of her prints, the one of the slice of light over the sea in Oregon. That hangs in the living room. Truly gorgeous. And here, just because, is yet another view of those bloody trees through the window. As you can see, the leaves (those that are left) have changed again. Last of all, a shot of the wall you didn’t get to see last time, this one with a print of Whitby Abbey on it. So that’s it, the latest iteration of my working space. Thanks. Jennifer’s photograph is gorgeous, especially the capture of the light. It has been my experience that you can discover a lot about a person by their office decoration and their bookcases. Yes. My snapshot doesn’t do it justice. I have a question and please excuse my ignorance but what does “pull my finger out” mean? I have never heard that expression and while I get the general meaning, I was just curious about the origin. < HREF="http://www.guardian.co.uk/notesandqueries/query/0,5753,-26685,00.html" REL="nofollow">Here<> are some amusing thoughts on the origins of ‘pull your finger out’ from the <>Guardian<>. Thanks, pretty much what I thought! You were right NIcola, I do like this post. :) Thanks for the compliments.I’m always interested to hear these word origins, but I think there was a little too much information for me in one or two of those theories…Now you are going to have to keep updating us on the view from your window as the seasons progress. It’s weird to see so many leaves gone from that tree, and the grass is still so green (and clean – the leaves are disappeared). The grass is always brilliantly green until about June, when it gets straw-like for three months. And right now it’s tidy because all the dropped leaves are stowed neatly in the yard-waste bin so everything looks lovely for K’s folks.I’m certainly happy to take execrable photos from my office window every couple of months. Perhaps I’ll take some from the front, too. Photography is a huge hobby of mine (it’d be a job if I could compete with the pros in Maine).One of the ideas I’ve had for a while is to take pictures of the exact same place (a tree in our yard, a section of our wood shed, a fragment of shoreline…) at different times during the year. Perhaps one a month. 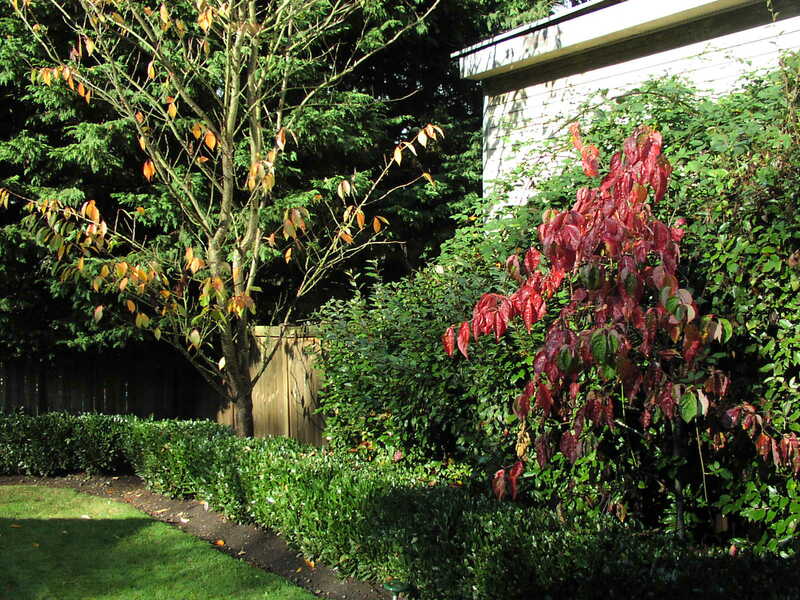 Then display them side-by-side.In my mind, it would help create a deeper connection between the viewer and that place, as well as give a sense of time that we don’t normally see in our day-to-day experience of those places.Your images of the trees in your yard brought back that idea…I think you should keep up the pattern! It feels like a very meaningful connection has been established. It must be the season. I changed around my living room and I feel like I now have a new house filled with brand new furniture. janine, perhaps sometime in spring we should do a gallery of garden pix here on the blog. Might be fun to see what everyone sees everyday.ssas, most people do their big cleaning/rearranging thing in spring, but to me autumn has always seemed like the beginning of the year. My favourite season. A time to make changes, even little tweaks. My guesses about your lunula post were totally off. But I can’t complain (even if there’s no Hild) because I enjoy looking at writers’ spaces. I also like your EgoWall. And Jennifer’s photo is so beautiful. No matter how many times I’ve seen it, it keeps drawing me in. Nicola, I think that’s a fantastic idea. The sense of connection in this online community would be awesome. I’d love to see what people notice in their gardens.I’ve had this grand idea of people hosting a “summit” every other year or so where we get together and talk about literature, each other, etc. Such ideas come to mind when one lives in the “wilds” of Maine. karina, yep, Jennifer makes pretties. Lovely stuff. And, hey, Hild was sort of in the post–a picture of Whitby Abbey, which she founded.janine, we really, really will do NicKelCon one of these days. But we’ll probably do the pix thing first. Start your cameras! I loved the peek inside your home and office. And I agree, what one displays reflects a lot about the person. 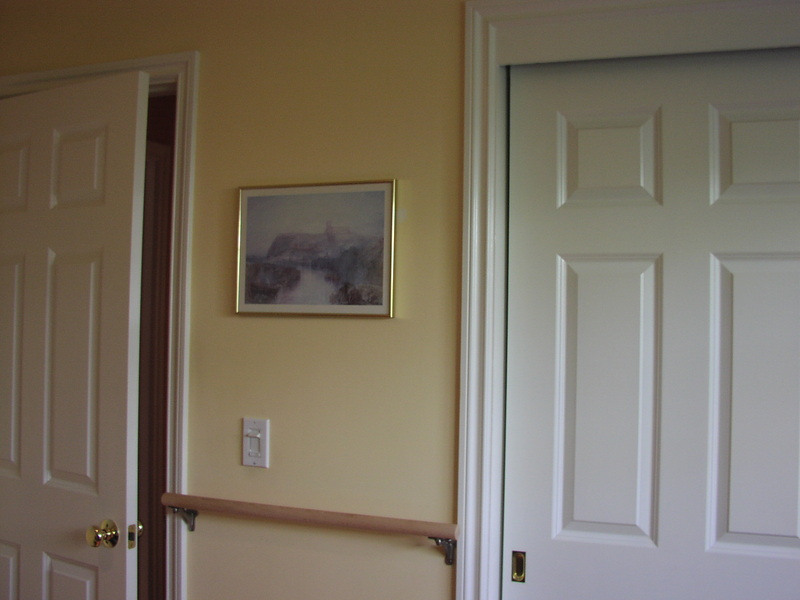 I loved the photo,the color of your walls offset by the white trim,and the second look at your yard. I am partial to black and white photos. IMO they reveal so much that sometimes is lost in color. I love the play of shadows and contrast. I have a very large print hanging in my office at work- Allen Birnbach’s Dutch Meadow Sunrise.My bedroom has a large Michael Austin print, Red Dress, above my bed. There is something about this print that had called my name for a long time!I am enjoying my day off from work and was having coffee while looking out my back french doors. The tree I spoke of, that turns wonderful shades of gold and crimson, is “doing it’s thing.”It seems just overnight the leaves have given up their anchorhold on the tree branches,said their respective goodbyes, and let go. Some still linger but soon will join them.I am not sure how to post a picture of the trees but I think it is a wonderful idea to be able to share what we see from our windows. I use < HREF="http://flickr.com" REL="nofollow">Flickr<> for photo sharing and really like it. It’s very easy to create groups so people can pool their photos around themes or events or whatever. But it would require all the participants to get a free Yahoo/Flickr account. Or people could just email me their photos and I can set the group page up. My server has enough space. I could set up a gallery on my mac.com thing. People can upload or download without having to sign up for anything. janine, karina, jennifer–the fewer steps the better on the photo sharing thing (we have a lot of people here who aren’t terribly <>au fait<> with web 2.0 stuff or even, frankly, web 1.0). So right now I’m thinking Jennifer’s mac gallery idea might be the simplest way.